St Johns Ambulance in Lymington have recently had a storage platform fitted by Hampshire Mezzanine Floors. The requirement was to create additional space for the storage of event equipment and general storage. 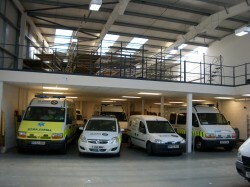 Hampshire Mezzanine Floors provided this extra space by fitting a mezzanine floor in the dead space above where ambulances are parked. 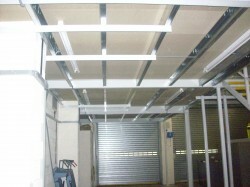 The mezzanine floor was designed to be a thin structure to maximise the headroom above and below the floor. 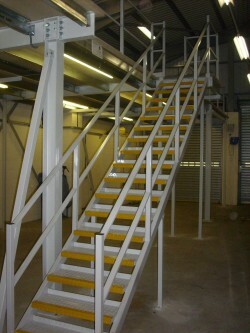 Access onto the storage platform was by a steel Part K Staircase with handrail. Hampshire Mezzanine Floors also fitted the fluorescent lighting and emergency lighting above and below the mezzanine floor giving a main contractor service to St Johns Ambulance. HMF administrated the Building Regulations Application and ensured the project was signed off quickly. 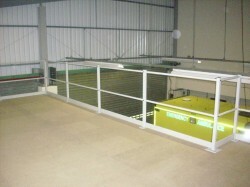 Edge protection was provided to the exposed edges of the mezzanine floor, including box section double tubular hand and knee rail and kickboard. St Johns Ambulance were very pleased with HMF for the way the project was implemented.